Since the early days of Esa-Prima Win, meshing is a strong asset of our analysis software, with a uniform mesh and precise control. Users have the possibility to make manual mesh refinements. Today, we are proud to bring to our users the next level in meshing technology: smart automatic mesh refinement with non-uniform meshes. Meshes in earlier versions have been generated by default with standard dimensions and coherent sizes. However, in some cases, a coarse mesh can lead to wrong interpretation of results, e.g. showing peak values in slabs in locations of supporting columns, which may be critical for the design of reinforcement. These peak values can be resolved by creating averaging zones, which in turn require fine mesh. Via manual mesh refinements, influencing mesh sizes at the position of the peak areas, appropriate values are obtained. Manual mesh refinement can be defined along a line, around a node and on a selected 2D member. 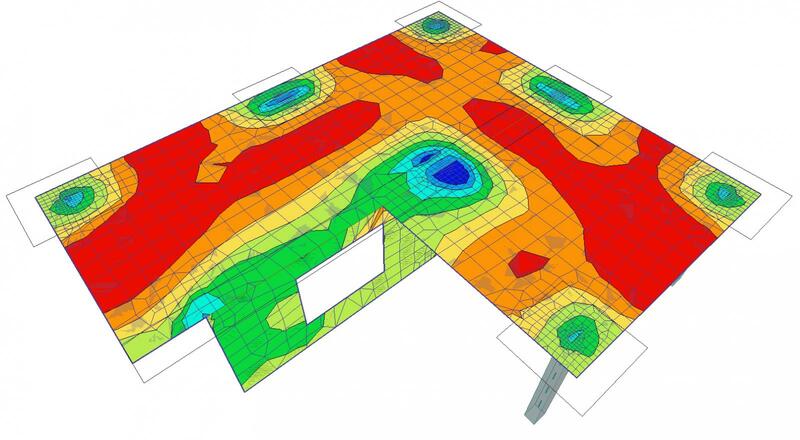 Moreover, Scia Engineer's meshing tools always provide a 100% coherent, gap-free mesh. Estimation of the ideal size of mesh elements is not always easy. Application of manual mesh refinements requires certain experience and represents often an iterative process to obtain proper values of refinements. Therefore, in Scia Engineer 14, we are introducing automated mesh refinement with a unique error estimator. The theory of the analysis of the a-posteriori error estimator in the finite element method has been developed by Zienkiewicz and Zhu based upon their observations (see articles  and ). Numerical evidence has been presented supporting this analysis. This implemented estimator uses a very simple idea. It calculates expected differences between values of stresses in a linear calculation in integration points of mesh elements, and the values of so-called improved element stresses at the same positions. The values of the improved stresses are recovered by minimizing the complementary energy over patches of elements and are calculated using the same approximation as for stresses in a linear calculation. The result is an a-posteriori estimation of the error. This way we can calculate an improved mesh precision in specified locations, based upon the Zienkiewicz-Zhu error estimator. Detailed information is available in the referenced book  by Zienkiewicz and Zhu. This new procedure provides more precise and more reliable results in an automated way, and in shorter time then before. It provides expertise in finite elements and mesh refinements, without having to spend hours of investigation and optimisation.